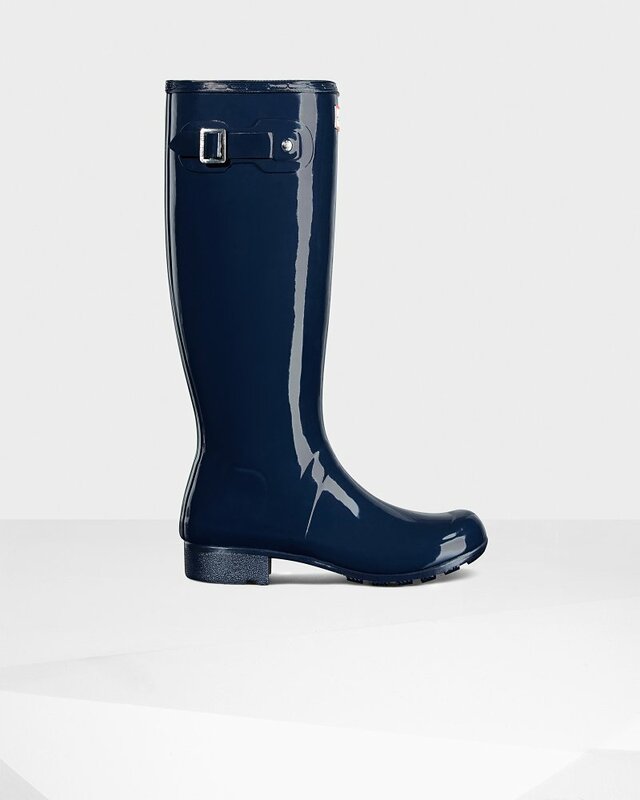 Women's Original Tour Gloss Rain Boots is rated 4.3 out of 5 by 218. La Tour Gloss Original es una innovadora reinterpretación del diseño de nuestra icónica bota Original. Construida en goma ligera con acabado de alto brillo, la caña de la bota se dobla, envolviéndose sobre el pie para que resulte más fácil de embalar y transportar. El diseño conserva muchas de las características clave de la tradicional bota de agua, incluyendo el bigote de Hunter y la hebilla con correa. -Goma -Forro: textil -Suela: goma - Cuidado: Utilice el Limpiador para botas y el Pulidor de goma de Hunter para mantener sus botas en las mejores condiciones. Rated 5 out of 5 by LAlady from I love my beautiful boots! I hesitated to buy rain boots because it never rains in LA. Until now!! These are perfect for running around town and comfortable enough for the mile walk to school and back. Plus they are so gorgeous and glossy. I love looking down at my feet! I also love that they are packable bc I will definitely be taking them on the road. Well done, Hunter! Rated 5 out of 5 by HappY from Excellent!!!! Great all over Best boot I've ever bought ,,, plus socks ,,,,,!,,,,!!! Rated 5 out of 5 by April from Great product Great product , great price , fit perfect ! Would buy again . Rated 5 out of 5 by Tima from I always love Hunter boots I been wearing these boots for over 10 years ... great all year round boots so glad you have wide calves and adjustable ones !!! Rated 2 out of 5 by Kaylee from Great boot overall. A lot more comfortable to me personally than the Original Tall. However, it was too tall for my short frame. I had to return it (sadly). I do hope Hunter comes out with a larger selection in terms of boot height and calf sizes. I don't want to have to settle for the short boot. Rated 5 out of 5 by Aleah from Amazing quality, and they always keep their shape. Rated 5 out of 5 by Danielel from These are the only rain boots I have ever purchased! This is my 3rd pair and the first pair of rain boots for my daughter. They’re great quality and I love how they can be worn in the winter time with socks as well. Rated 5 out of 5 by Victoria from My fifth pair of these fabulous boots! They are fashionable, comfortable and easy to see for.